Come to the Kasbah! I have always wanted to say that, laughing! Really, come and sit with me in this fantastic inner courtyard that has the inviting essence of a modern Moroccan Riad. Take a moment to relax, upon the regal Mirage Sultan’s White Set, which is an exclusive for this round of the 68 Main Event. 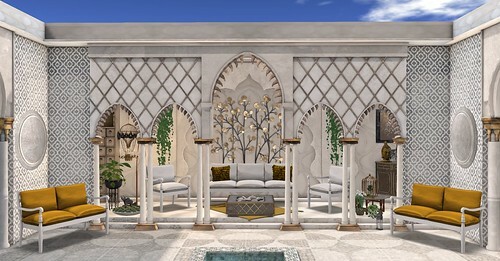 Enjoy your private world, resplendent with Arabesque Architecture, upon the luxurious Sultan’s Set Sofa, Armchair, or Loveseat, that makes this inviting seating area an irresistible retreat where warm, perfumed breezes greets you as if a kiss! The Mirage Sultan Set will be available, exclusively, at the 68 Main Event until May 28th.